Barley porridge for breakfast is a real boon for our digestion, it is easy for the stomach because it is easily digested and thereby contains an abundance of minerals, antioxidants and valuable vitamins. These foods are high in fibre and do not contain any bad fat, and nutritionists recommend it as a super food weight loss. Barley in the diet is present in a large number of dishes, which are still somewhat neglected, and on this occasion, we turn our attention to everything we can do to take advantage of this remarkable food. What immediately comes to mind to some people is barley beer, because if it is good for beer it will be good for different meals. Thanks to the high energy values, eating barley is especially recommended for children, athletes (amateurs and professionals), as well as people exposed to increased physical and mental effort. Barley porridge for breakfast is the right choice to start the day and is recommended by many nutritionists. This is one of the oldest cultivated cereals in the world that comes from western Asia and north-eastern parts of Africa. It is considered one of the most important grains, due to the specific composition that is different from the other plants in this group, and many civilizations used barley as a cure for various ailments. It abounds in minerals such as potassium, phosphorus, calcium, iron, magnesium, iodine, and the valuable vitamins C, A, B, E and K groups, which is especially recommended for infants because it accelerates faster growth. In addition, the barley is very rich in inositol substance that plays an important role in the regulation of cholesterol, and prevents the accumulation of fat in the liver. It has a beneficial effect on the nervous system, improves mental capacity, reduces symptoms of anxiety and depression, and in addition, is an effective detoxifier of the body, especially when it comes to our stomach, lungs and kidneys. Thanks to its pleasant taste and high nutritional value, barley is very grateful for the preparation of different dishes, salads and many other sweets. Barley porridge can be used as a mild laxative, because it is rich in soluble fibre, necessary for normal functioning of our intestinal micro flora. Consumption of the third (1/3) of a cup of cooked barley grain can facilitate digestion and eliminate problems with constipation and hard stools. It is used for the production of barley flour and flakes that are commonly consumed for breakfast in combination with other grains. This plant is also used to manufacture beer and barley coffee, which is particularly recommended for the elderly and children, it is not harmful because it does not contain caffeine. In addition, it can be formulated as a medicinal tea that is effective in the case of colds and digestive problems. 100 grams of barley porridge contains up to 360 calories, 83.6 grams carbohydrates, 7.9 grams of protein and 1.7 grams of fat. As you conclude there are no harmful fats, which is very good. Meals with barley are quite neglected in the kitchen, and are very easy to make. 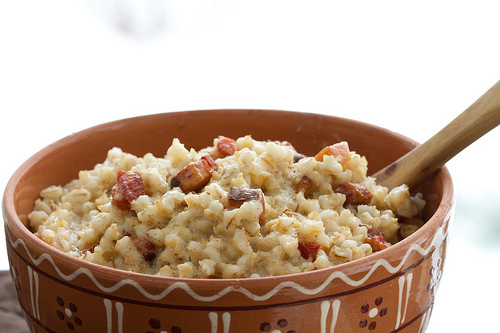 Barley porridge as a side dish may be added to the number of stews such as beans and the like. You do not have to be a culinary expert to do it properly, and the most interesting recipes are coming up. The main recommendation is that the barley is soaked in water the previous night, although it is feasible and that you directly cook it without previously soaking it. We always got a thicker mixture when we soaked it the night before. In appropriate pot pour the water and therefore deliver in barley (previously soaked or not). Please note that the proportion is one to three (1: 3) in favour of water. As soon as the water boils, reduce the heat on the stove and continue to cook for 45 minutes. Do not forget that from time to time you pour some water in, because the barley absorbs it very quickly, so it is possible to completely burn. Turn off the heat only when you are sure that everything is well cooked. Remove the pot to the side and leave it more than 60 minutes to rest because the barley needs to soak up the remaining water. After that, strain it well - congratulations the recipe for barley porridge is completely ready for serving. If you have made a sizable amount, after it cools down you can place and keep it in the fridge. Depending on the type, barley porridge is usually whitish-brown in colour. Now that you have made it, you can use it however you want, we like the best sweet barley porridge for breakfast and in the following variants. Barley porridge, yogurt, scoop of honey and forest fruits. Barley porridge, soybean milk, cashews and homemade jam. Barley porridge, kefir, dried fruits and compote. Believe us, whatever combinations you choose there will be no error. The salt variants you add spinach, beans and other vegetables, served with mushrooms, chicken but barley porridge with vegetables can also be made. Preparation: In a separate bowl mix egg with sugar. Mix snowflakes with dust from yeast and lemon rind, then pour them into the mixture of eggs. Then add the pine nuts and butter, and all mix well until a solid mixture is formed. Separate a small amount of mixture and spread it in moulds and bake in a pre-heated oven at an average of 180 ° C for about 25 minutes. Garnish with mint leaves, if desired, pour with honey. All meals with barley are specific in their own way and some we like more or less. Barley porridge with vegetables is one of those simple recipes, which you definitely need to try. 3 tablespoons of olive oil, 250 ml of vegetable broth. Preparation: Prepare a deep frying pan, put oil in it, put the onions and chopped aromatic herbs, but put everything to be stewed on a low heat. Then add barley, pour all the wine, and let it simmer a little, stirring occasionally with a wooden ladle. Slowly add the broth, and let the mixture cook for 40-50 minutes. Three minutes before the meal is removed from the heat, add the remaining herbs. This dish of barley is served hot as a supplement with fish dishes and seafood. How to prepare a salad of barley with prawns? Clean the prawns. Prepare a larger pot, pour water, oil and salt, and let it cook. In the water slowly add the parsley and the head of the shrimp. During that time, wash the barley, drain it, and put it in a pan and put aside. When the soup is made, strain it, and add to barley. If necessary put a little salt in the soup, then cover the pot and cook for about 15 minutes, until steam starts to come out. During this time salt the peas, and put it to boil for about 10 minutes. Cut open the prawns along the entire length, add salt and pepper to taste, and let it cook. After that, oil the second pan, add garlic and leeks, and fry everything. When ready, put into a deeper arc glass or plastic box, vinegar and oil, and mix all the ingredients in a mixer to obtain a fine coating. Mix the cooked barley, peas, and half of the gradient of the port, and stir everything well. Serve salad along tray, sort prawns over it, and spread the tomato as decoration around the salad. Then pour the remaining onion syrup. As you can see barley can very much be used in cooking in a large number of meals. If you have not used the barley in the diet, we recommend barley porridge for breakfast, which is easy to prepare.